Lentil cookies seem to be the next fad in the baking world, as most of you are moving to gluten-free recipes. Perhaps gluten is itself a controversial term and nobody can say clearly what product has gluten. But one thing is sure - lentils are gluten free. If you have come here for a gluten free cookie recipe, then this is it. However, I must say I have used oatmeal in addition to legumes, and whether oat is gluten free or not depends on a number of factors. I have covered the topic "Do oats contain gluten" on another page. Surprisingly, oatmeal is basically gluten free, but it still depends on where it is grown. If harvested close to wheat fields, oat grain may have gluten, since wheat has gluten. Anyway, gluten is not bad for everyone unless you are gluten insensitive or have celiac disease. Let's come back to the lentil cookie recipe that uses no raising agent. 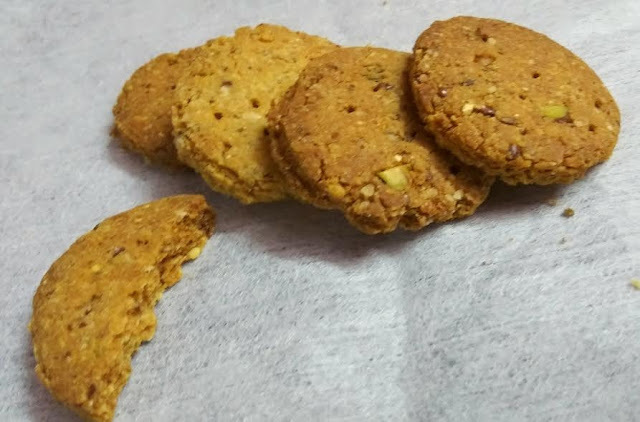 What inspired me to try out lentil cookies was my desire to make sathu mavu cookies. Sathu mavu is primarily a flour made from sprouted grains, lentils, and nuts. While I still do not have time for sprouting all pulses, nor do I have access to all these lentils, I have ventured into the lentil cookie baking journey with 2 legumes. I have used roasted black gram and besan (chickpea/gram flour) for the recipe. My first attempt at making it sans oatmeal rewarded me with a marvel - I wanted to make crunchy cookies but ended up baking a small batch of melt-in-mouth nankhatai. The reason being the use of ghee alone in the recipe. The dough was too soft. I thought I have ended up making besan burfi. But the texture was akin to nankhatai. 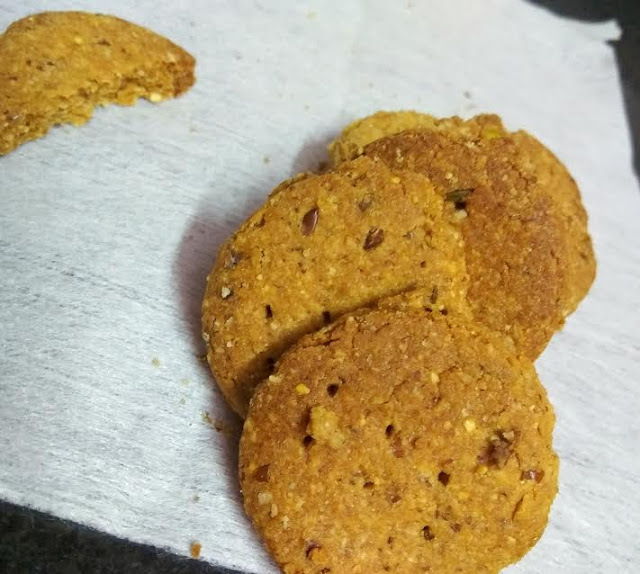 So the next try was to make them little crunchy like biscuits, and voila! it happened exactly as I wanted. Rich source of dietary fiber, iron, vitamin B6, copper, phosphorus, and manganese. These are packed with proteins, folate, magnesium and potassium. They are heart friendly sources of food that are just perfect partners of your health, thanks to their abundance of minerals and essential vitamins. 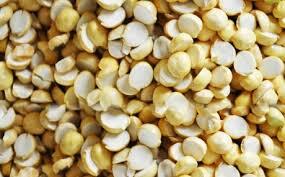 Chana dal gives you chickpea flour or besan. Roasted bengal gram or puttani is black gram roasted and halved into dal. Actually, it is nothing more than dehusked black gram or roasted kala chana . Raw cane sugar is a form of sugar with molasses. When sugarcane is processed, the first form is Jaggery, then it is further processed to raw cane sugar and the final processing result is sugar. Mineral compounds are high in jaggery, and processing reduces the minerals in each stage. Sugar has zero mineral compounds. It has only empty calories. Jaggery is more complex than sugar, as it is made from a long chain of sucrose, so it releases blood glucose slowly and does not cause a spike in sugar levels in the body. It cleanses lung, stomach, intestines, esophagus, and respiratory tract. People with chest congestion and infections can benefit from the use of jaggery. Jaggery has a good amount of iron (ferrous salt). Raw cane sugar is a compromise between sugar and jaggery. Due to the presence of ferrous, jaggery has a salty taste and some people prefer sugar to jaggery for this reason. Mix ghee, oil, and sugar/jaggery powder. I have run out of jaggery powder and it is not accessible any longer in this season, so had to resort to sugar powder. Add fennel seeds, salt, and flax powder. Drop in the dal powder, besan, almond powder, and oatmeal. Mix. AVOID KNEADING. If you knead, it will form gluten and the cookies will turn out to be chewy. But we want them crunchy, so just mix and gather. Try to gather the ingredients. If the dough looks dry, add 1 tsp milk to bind the dough. It should be soft. Preheat oven (microwave convection) at 170 degrees for 5 mts. I made these in airfryer- no need to preheat. Roll out into a thick chapati and cut into cookie shapes. Use a fork to make insertions into the lentil cookies. 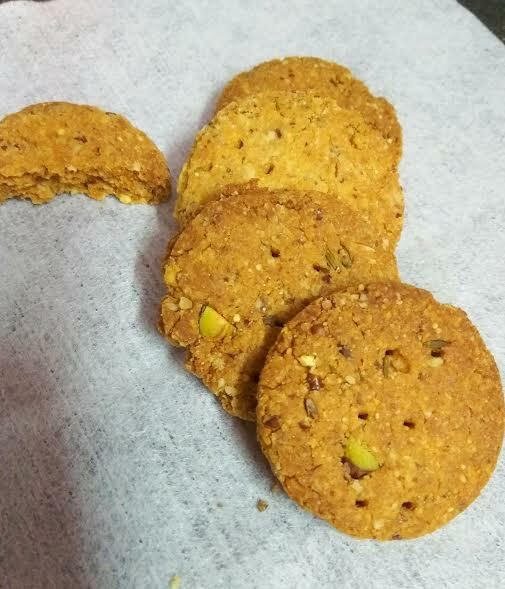 Since we are not using any raising agent, insertions will help in even baking and help in making the lentil cookies soft, crunchy. Place in the greased baking tray and bake at 170 for 10-12 mts or until the top browns a little. Or airfry the cookies at the same temperature for 10 mts. Then check and airfry for 4-5 mts more. Allow the gluten free cookies to cool down completely before munching on them. Enjoy healthy cookies in every single crunchy lentil bite.